The Woolley’s team are qualified gas fitters with the experience and equipment to install and service all your gas appliances to meet manufacturer specifications. For all your gas appliance requirements, call us on 1300 367 626 or email us. Natural gas has no smell, but a pungent fragrance is added so you can smell even a tiny leak. All gas appliances have to be approved and certified for use, to ensure their safety. It is estimated that Australia has more than 800 trillion cubic feet of gas resources (enough to power a city of 1 million people for 16,000 years). Natural gas is also called methane. Gas appliances not serviced can become dangerous. Service every 2 years at a minimum. Natural gas is the third most important energy commodity in Australia, providing an estimated 20% of Australia’s energy requirements. Natural gas is not the same as LPG or bottled gas, appliances can only use one or the other. There are more than 33,000km of high-pressure steel pipelines in Australia, of which more than 25,000 kilometers are used for natural gas transmission. 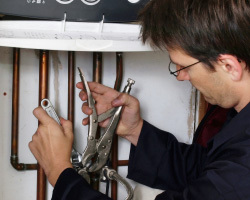 Only a qualified gas fitter can work on gas appliances, or install gas lines.